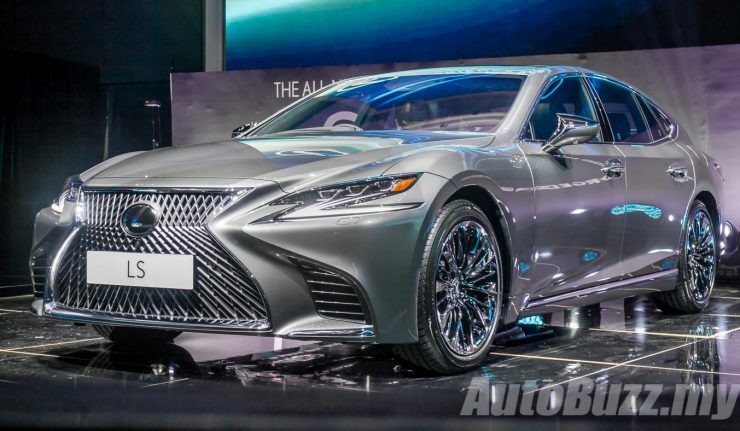 Shortly after accepting orders for the fifth-generation Lexus LS, Lexus Malaysia has officially introduced their flagship sedan here in Malaysia. Exclusively produced at Lexus factory in Tahara, Japan, the luxury limousine does not come with a price advantage against the locally assembled Mercedes-Benz S-Class and BMW 7 Series. All three variants of the LS – LS 500 Luxury, LS 500 Executive and LS 500h Executive sits on Lexus’ new Global Architecture – Luxury (GA-L) platform that will underpin all future rear-wheel-drive models, the new limousine measures at 5,235 mm in length, 1,450 mm in height and 1,900 mm in width with a wheelbase of 3,125 mm, 33 mm longer than the previous-gen long-wheelbase version! Lexus has reimagined the LS with the tagline “A Flagship Reborn”, taking much of its design cues from the futuristic LC Coupe. On the outside, all three variants of the LS are identical with triple beam adaptive LED headlamps with L-Shaped LED daytime running lights, Spindle mesh grille, sequential turn signals, LED taillamps and a powered boot. 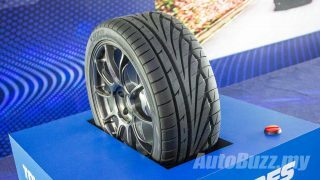 Standard on the LS are those 20-inch multi-spoke polished alloys wrapped in 245/45 profile tyres. Unfortunately, there will not be an option for the sharp F-Sport. Inside, the cabin was inspired by Omotenashi, translated to Japanese Hospitality, creating an inviting and luxurious space for passengers and drivers. As standard, the LS is furnished with Art Wood Grain and leather, but Executive variants of the LS have the option for Kiriko glassware – a type of Japanese striking cut glass ornamentation and Hand-pleated Upholstery. How much for the swanky Kiriko glassware you ask? RM98,000. Standard equipment is properly extensive for a luxury limousine – suede headlining, 12.3-inch Electro Multi Vision Display, 24-inch head-up display, quad-zone automatic climate control with Clean Air filter, Lexus Climate Concierge, illuminated entry system, moonroof, vacuum doors, powered sunshades for rear windows and 28-powered adjusted front seats with massage function. The entry-level Luxury variant gets a 12-speaker Pioneer sound system and 18-way powered rear seats with ventilation function while the more expensive Executive models add on a 23-speaker Mark Levinson surround sound system, 22-way powered rear seats with Ottoman and massage function. Underneath the LS 500 is a new 3.5-litre twin-turbo V6 that develops 415 hp and 600 Nm of twisting force. All that power is channelled to the rear wheels via a 10-speed automatic transmission. Century sprint is done in a blistering 5.0 seconds onwards to a top speed of 250 km/h. The range-topping LS 500h hybrid variant is motivated by the Lexus Multi Stage Hybrid System, a 3.5-litre naturally aspirated V6 Dual VVT-i petrol engine packing 295 hp and 350 Nm of torque, further assisted by two electric motors with 176 hp and 300 Nm. Transmission employed here is an innovative Multi Stage Hybrid transmission that marries a four-speed automatic with an e-CVT that mimics a shift pattern of a 10-speed gearbox to deliver a linear acceleration that is free from the typical “rubber band” effect. We have detailed this system here. The LS 500h is no slouch too, capable of sprinting from 0 to 100 km/h in 5.4 seconds and register a restricted top speed of 250 km/h. All variants of the LS ride on Adaptive Variable air suspension for exceptional ride quality. Because the new LS is lower than before, the air suspension system features an access function that automatically raises the car’s height by 30 mm for better ingress and egress. As the flagship Lexus model, the LS range is equipped with the full suite of Lexus Safety System+ that bundles Pre-Collision System (PCS), Lane Departure Alert, Adaptive Cruise Control, Lane Departure Alert, Adaptive High-Beam System and Lane Keep Assist. Other standard equipment includes 12 airbags, Panoramic View Monitor and Blind Spot Monitor. There are a total of 11 exterior colours to choose from – Sonic Quartz, Sonic Silver, Sonic Titanium, Manganese Luster, Black, Graphite Black Glass Flake, Red Mica Crystal Shine, Sonic Agate, Sleek Ecru Metallic, Amber Crystal Shine and Deep Blue Mica. Luxury models can choose between Black/Art Wood or Noble Brown/Art Wood interior theme while Executive models have four options – Crimson & Black/Kiriko Glass, Black/Kiriko Glass, Crimson & Black/Art Wood and Black/Art Wood.